Quilter’s Heaven is a friendly, full service quilt shop bursting with a wide variety of vibrant fabrics, inspirational patterns, kits, and books, as well a notions wall packed with the latest gadgets and tools. Located in Northbrook, IL, our store features a welcoming atmosphere where learning and creativity thrive. We offer an extensive range of classes for quilters of all skill levels, along with long arm quilting services to help you finish your projects. From our bold selection of brightly colored fabrics, to our exceptional customer care, we’ve got the products and services you need for a more enjoyable and successful quilting experience. Contact us today to learn more! 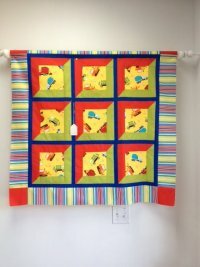 A cute litle boy quilt using truck fabric.